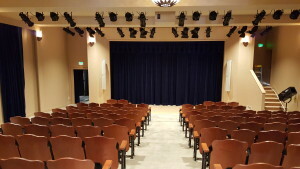 On Sunday June 5th I’ll be performing an afternoon program at the newly remodeled Birkenfield theatre located in the Clatskanie Cultural Center, 75 South Nehalem in Clatskanie, Oregon. The concert begins at 3 pm. Tickets are $10 and may be reserved by calling 504.728.3403 or purchased at the door the day of the performance. The ticket booth opens opens 30 minutes prior to the performance at 2:30. Elsa Wooley, Executive Director of the Clatskanie Arts Commission, and I have been talking about my performance at the intimate 168 seat theatre for a few years. Finally, as the 18 month and 3 million dollar plus renovation finished we settled on a date. “We thought of you right off the bat” Elsa said – the 168 seat hall could a great setting for a classical guitar recital. One of the aspects I enjoy most about playing smaller communities is the fervent support for the arts. Sometimes that passion comes in the form of historic renovations. I’ve played in many Opera Houses and theaters in historic buildings that were once slated for demolition and turned into performing spaces when local arts advocates stepped. This changes a communities landscape dramatically. 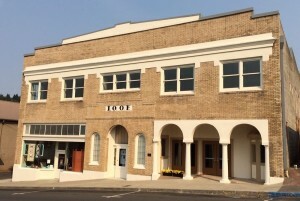 For decades, the Independent Order of Odd Fellows Hall (home of the new Birkenfield Theatre) was a prominent center of community life in Clatskanie. The building was added to the National Registry of Historic Places in 2012. 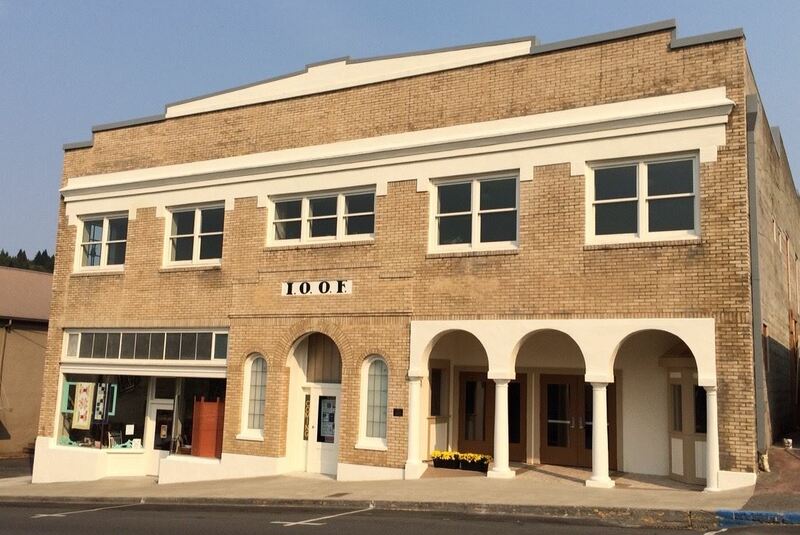 Nearly every adult who grew up in Clatskanie remembers going to movies, dance classes, public celebrations and civic meetings at the I.O.O.F Hall. Watching movies at the ground floor Avalon Theater was a popular activity, but by the 1990s the building became an eyesore. After it was sold by the dwindling membership of the Odd Fellows Lodge, it fell into disrepair through neglect by a series of private owners. Renovating the I.O.O.F. Hall began to emerge as a dream of community members in the late 1990s. 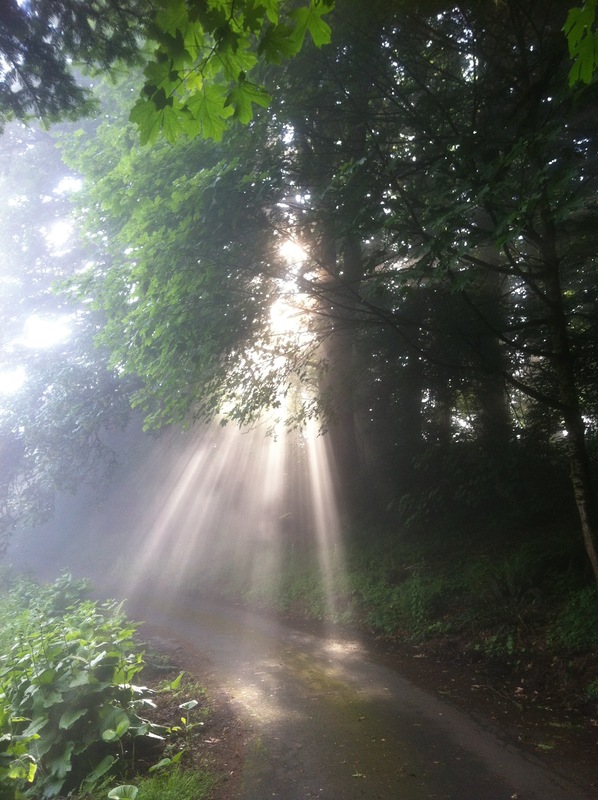 In 2005 when the Clatskanie Foundation received a significant bequest from the estate of C. Keith Birkenfeld, for whom the building’s new theater is named. On the Sunday June 5th program I’ll be performing works from my Romance for Guitar recording as well as works by Weiss, Walton and Albeniz. 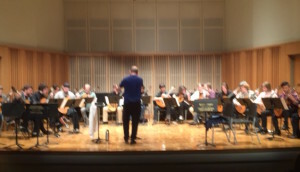 The 25th Annual Northwest Guitar Festival took place the last weekend in March at the University of Idaho in Moscow, Idaho under founding director James Reid. The festival was started in 1991 to give students in the Northwest an opportunity to attend an event similar to the international GFA Festival but at a lower cost and for a shorter period. In recent years, the addition of a youth competition (this year aided by a generous donation from Michael Nicoella and Michael Partington) and the guitar orchestra has helped the festival grow. The annual festival travels around to a different city in the Pacific Northwest and Western Canada. The 2017 Northwest Guitar Festival will be held April 7-9 at Portland State University under the direction of PSU Guitar Instructor and Oregon Guitar Quartet member Jesse McCann. This year’s festival delivered fantastic performances. Interestingly there were only two solo guitar programs; Seattle guitarist Michael Nicoella, (on classical and electric guitar) and Michael Videon from Bozeman. 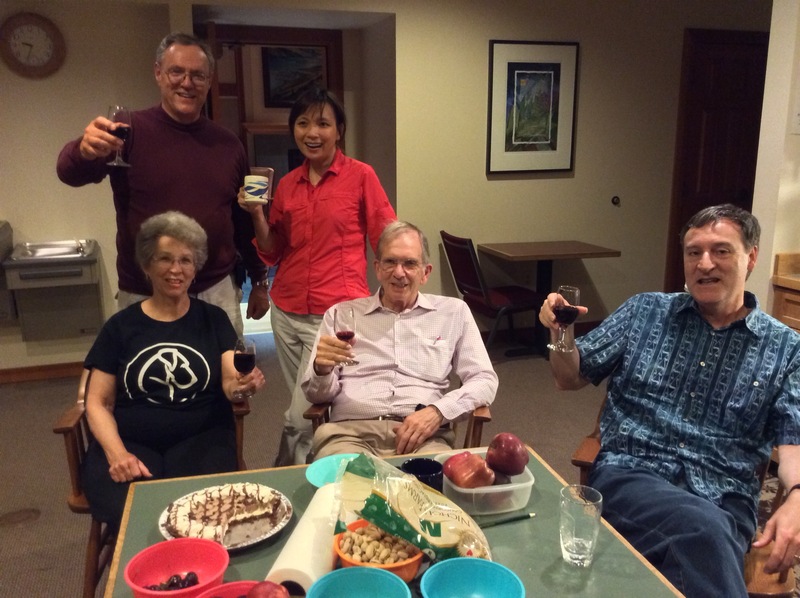 Other performances included interesting ensembles including Michael and Kelleren Millham (voice and guitar), David Feingold (solo guitar, guitar and violin and guitar, violin and bass) and of course The Oregon Guitar Quartet. 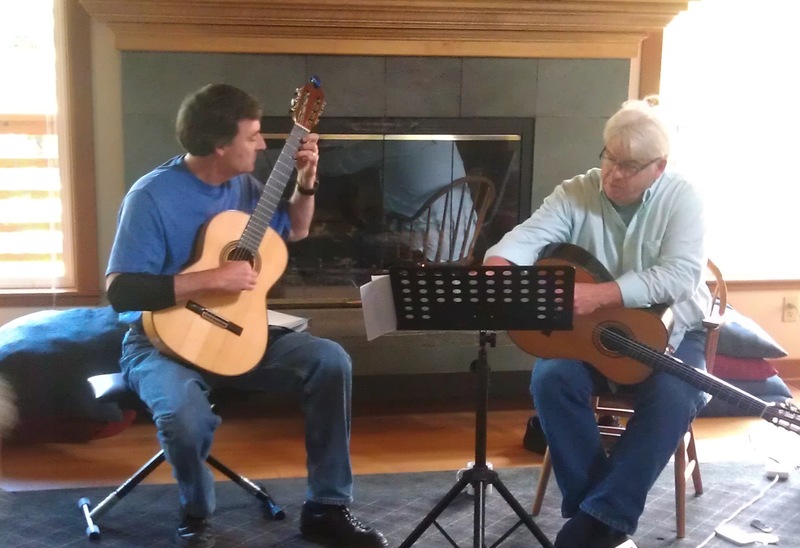 Finishing the weekend was a performance by artistic director James Reid and John Paul Shield, the South Hill Guitar Duo from Idaho. 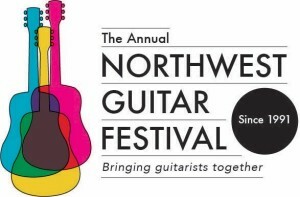 Oh, and I almost forgot the NW Guitar Festival Orchestra under the direction of Mark Wilson (Seattle). 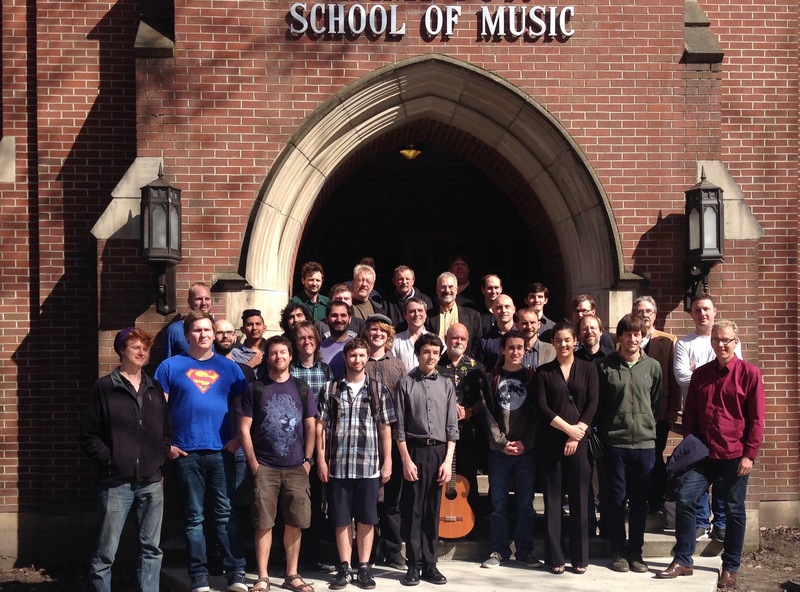 Guitarist/Composers also shined at the NWGF. 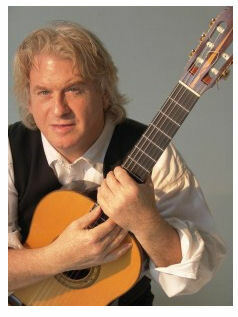 Michael Nicoella and David Feingold have written some substantial works for solo guitar. 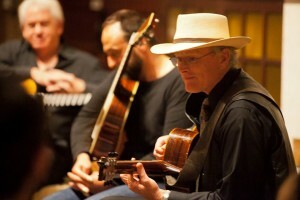 Bryan Johanson’s “Quartet on an Abandoned Prelude” performed by the Oregon Guitar Quartet showcased his skills as a composer, arranger and guitarists. All of these composers deserve looking into for the guitarist who wants to venture into 21st Century repertoire. 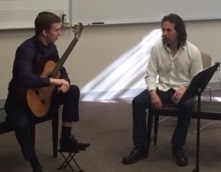 Aside from the performances the three days were filled with masterclasses by Michael Nicoella, Bryan Johanson (OGQ) and David Feingold, a lecture by Spokane guitarist Dr. Paul Grove, guitar orchestra rehearsals as well as a youth and adult competitions. 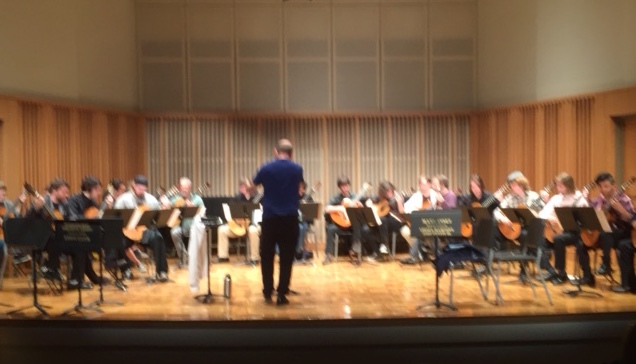 Mark Wilson reminded me that I performed in the first NW Guitar Festival, also held in Moscow, Idaho in 1991 and even remembered some of what I performed; Electric Counterpoint by Steve Reich and a major work that I commissioned from Bryan Johanson. It was about that time frame that I began to tour heavily throughout the US, Canada and Europe and left my teaching jobs at Lewis & Clark and Reed Colleges. While I was out ‘goofing off’ teacher/performers like Bryan Johanson, David Feingold, James Reid, Alex Dunn, Michael Nicoella, Michael Partington, and others were training students who went on to develop collegiate programs and active studios in cities throughout the NW including Pullman, Spokane, Pasco, Cheny, Lewiston and Bozeman. Many of their students were performers at this year’s festival. Its inspiring to see how their work has flourished. It was a great weekend personally. 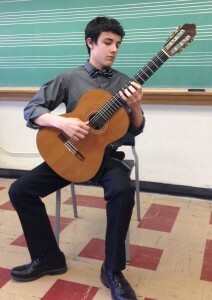 My student Michael Hermes placed first in the youth competition (see more on the Youth Competition HERE). 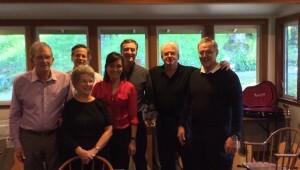 and I was able to reconnect with old friends and meet new ones. Inspired by the performers and masterclasses I got up early each morning to get a solid practice completed before my day began! Don’t miss next year’s festival! Big thanks to founder James Reid for his forethought and endurance, to all the teacher/performers in the regions who have been instrumental in furthering the guitar in our region!! 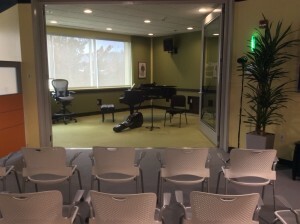 Thursdays @ Three concerts are broadcast live and in real time from our studios in the Hampton Opera Center, and programs last about an hour. If you would like to join our studio audien ce open this link (Live Studio Audience Reservation), and select the Sign Up button at the bottom of the May 12th event listing. These are small group audience experiences that fill up fast. Seating is available on first come, first served basis. 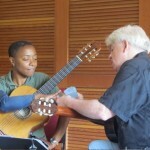 On May 12th I’ll be joining lutenist Ronn MacFarlane in a program of music for lute and classical guitar. 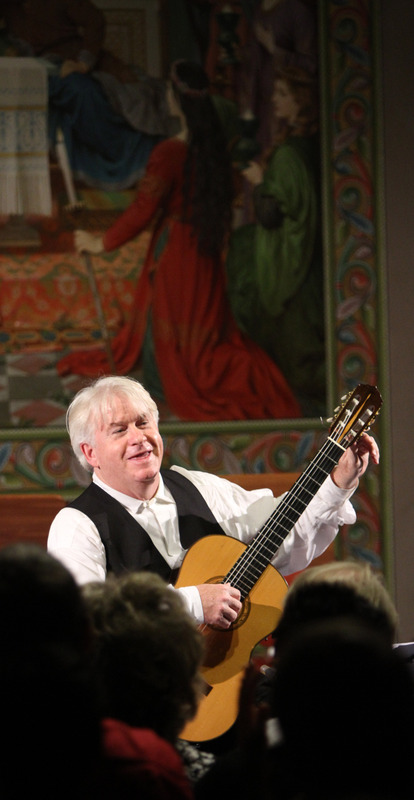 I’ll be previewing works from my June 6th performance for the newly remodeled historic performance hall in Clatskanie, Oregon with works by Walton, Turina and even playing some lute arrangements for the classical guitar, under the watchful eye of lute master Ronn! (Tickets for my June 6th performance in Clatskanie, Oregon can be purchased by calling the Clatskanie Arts Commission at 503.728.3403). So join us in the studio on May 12th or listen at All Classical FM89.9. And if you can’t do either you can still listen to archived broadcasts at the link provided above. Fifteen year old classical guitarist Michael Hermes, (Kritzer Studio student since 2012) took first place in the 25th Annual Northwest Guitar Festival’s Youth Division Competition held at the University of Idaho in Moscow, Idaho. 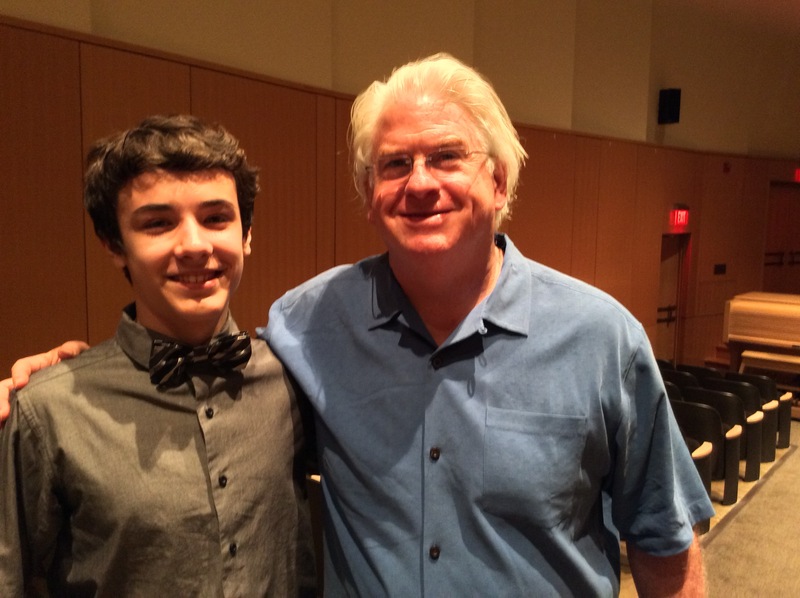 The Youth Competition was made possible by generous donations from Michael Nicoella and Michael Partington. Michael competed against a large field of guitarists ranging in age from 13-18 years old. In the semi-final round Michael played Valse, Opus 8 by Augustin Barrios. Three guitarists were then chosen for the final round where each played a 15 minute program of their choosing. Third Place went to Abigail Gilbert who played with confidence and strong tone. I really enjoyed her O’maggio pour Debussy by Manuel de Falla. The first ‘modern’ piece written in the 20th century which calls for mature color and phrasing – all of which Abigail brought out like a seasoned player. Lucas Victor placed Second. Deeply felt emotion was Lucas’ strong point. His unique phrasing was personal, intimate and effective. A very enjoyable performer who puts 100% of himself into the performance. 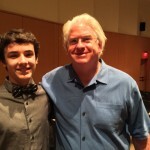 Michael played a stellar program of mostly virtuoso works. 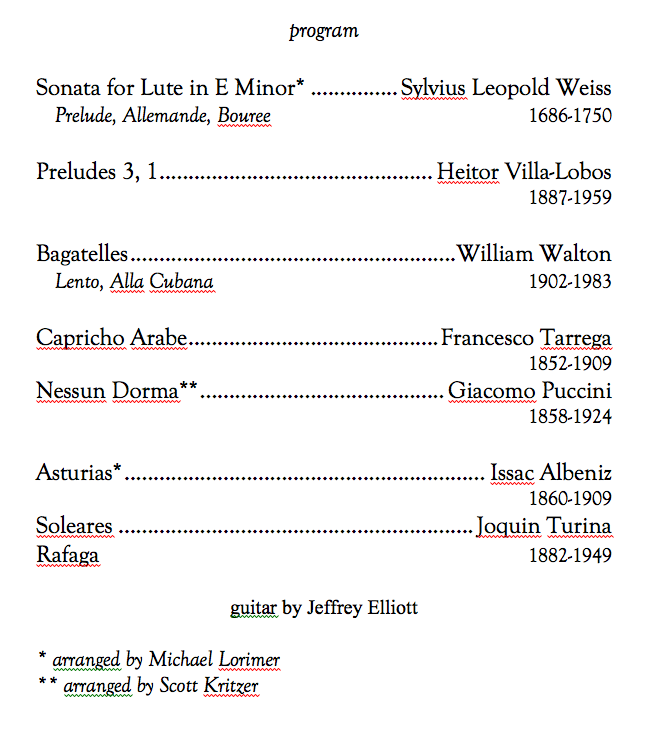 In addtion to the Barrios Valse mentioned earlier he performed Las Abejas by the same composer. His tempo on the latter perhaps reflected our pep talk backstage or the fact that he had to get all the repertoire in under 15 minutes. Regardless, his tempo was quick and playing increadibly clean. His second work was meant to contrast the virtuosity of the opening set and Michael didn’t disappoint. He played Endecha by Francisco Tarrega with beautiful phrasing and warm tone. Finally he finished with the Prelude and Allegro from Bach’s famed Prelude, Fuge and Allegro, Michael Lorimer edition. The Prelude was thoughtful and the Allegro was a real romp. Michael’s stage presence was fantastic. Dressed sharply with a bow tie he walked confidently on stage and literally took the stage, occasionally looking out the audience and smiling while simultaneously negotiated trecherous passages. Sitting and waiting for the judges decision was grueling. 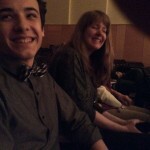 Micheal was joined by his mother and grandmother and we were a row of bundled nerves. I looked over at Abigail’s father and saw the same look on his face and gave him a ‘thumbs up’. Relief came when the final decision was announced. I was so proud of Micheal – he fought the demons that all competitiors and performers must learn to do. He faced his fears and beat them down with probably the best performance of his lifetime. 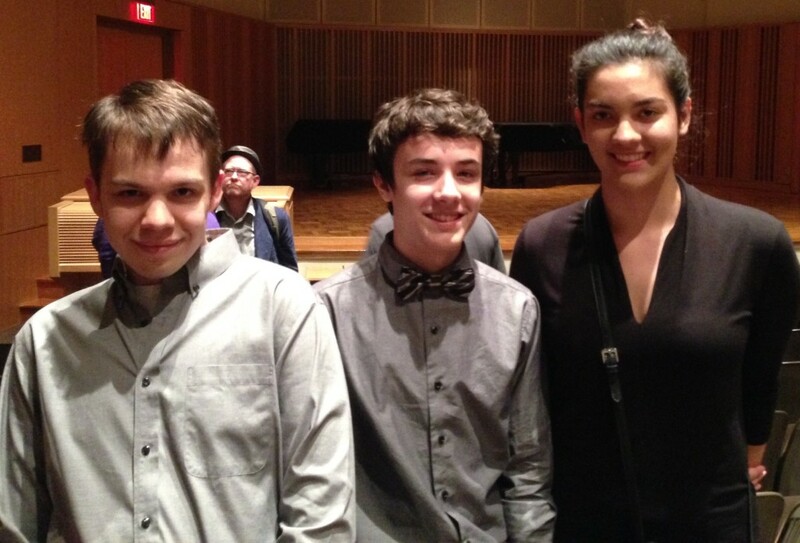 Bravo to Micheal, Abigail and Lucas and the parents of these fine kids, and to all the other competitors. As my teacher taught me, and I try to instill in my students; the preparation is where you gain 95% of the benefits. In addition to his first place dollar award Michael and his family won a trip to his favorite restaurant, (Sharis), courtesy of his guitar teacher. 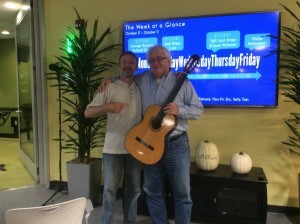 A special thanks to James Reid, Founder Northwest Guitar Festival. 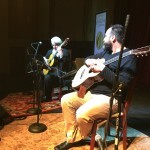 Baker City Community Concerts will be presenting the Acoustic Guitar Masters in performance on Saturday, April 16 at 7:00 pm at the Baker City High School Auditorium in Baker City, Oregon. Acoustic Guitar Masters brings together fingerstyle, jazz and classical music in the hands of three masters of the instrument. 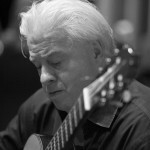 AGM features jazz guitarist Eric Skye. 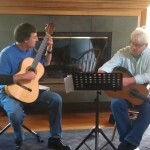 finger style guitarist Mark Hanson and yours truly on the classical guitar. We had a great time travelling and performing in Red Bluff, California (and Eugene, Oregon) last January where we performed to a sold out house and also had the opportunity to perform for over 200 school children. For ticket information to our Baker City performance please go to the Baker City Community Concert page. It’s been a long year of recovery. Most of you know that I took a bad fall off some stairs last January. I had to have my patella and quad muscles reattached. Nasty and painful business with a year long recovery, the anniversary of which is coming later this month! So now I’m jumping back on the saddle for the first time in over a year. Fortunately my load will be greatly lightened as I have the honor to be sharing the stage with two great musicians, Eric Skye (acoustic jazz guitarist) and Mark Hanson (fingerstyle guitarist) when we revive our Acoustic Guitar Master’s program from October of 2014. 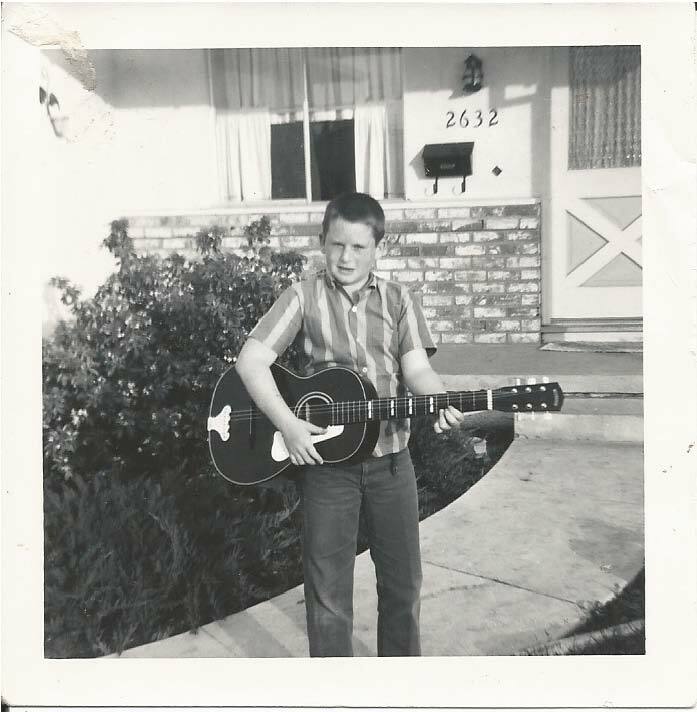 Getting back into playing and performing shape was a fascinating sojourn. I’m at once grateful for what I’ve learned (both personally and musically) and weary of ever being forced into a recovery mode again. I was immobile for the first quarter of last year while I worked on musicianship skills away from the guitar. Singing and conducting my repertoire gave me a new appreciation for the nuances that I had been missing in even my long standing repertoire! I only started to practice again last May, and on a limited basis. Then I spent the summer studying and advancing my technique and in the fall began to layer that work into my repertoire pieces. I’m both excited and nervous about stepping back on stage again to see where I stand. But fortunately I’ll be standing (well sitting) next to two fantastic musicians. 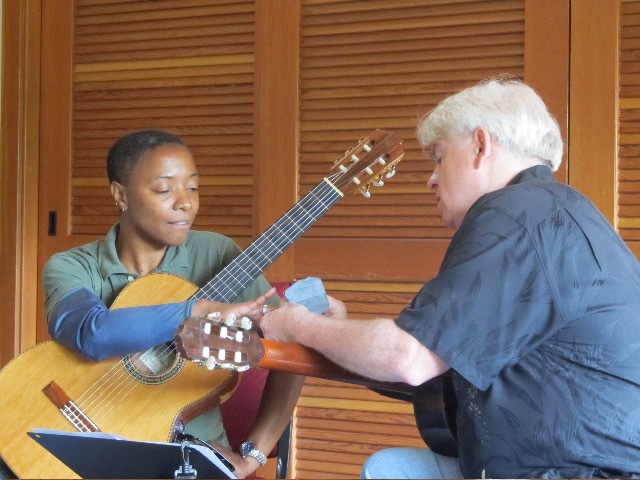 Acoustic Guitar Masters was formed in October of 2014. 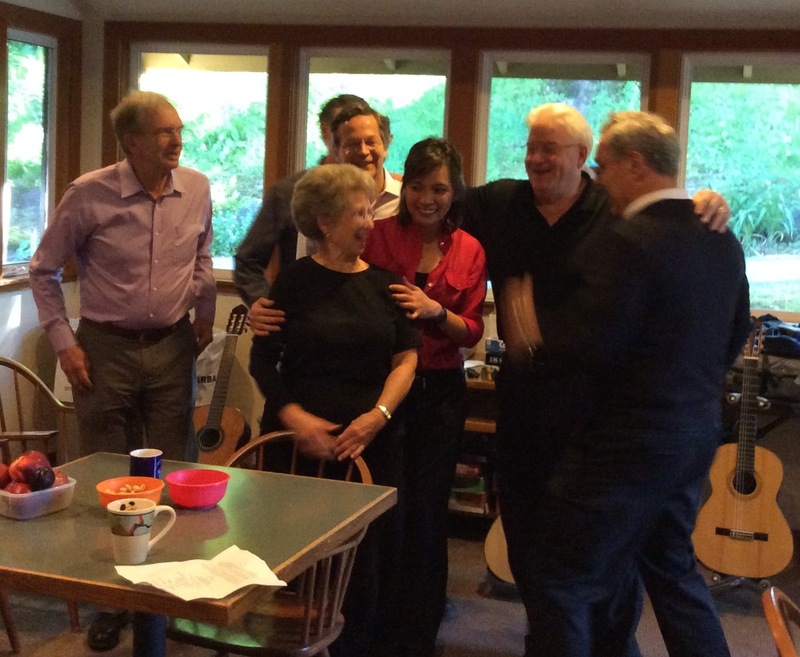 Eric, Mark and I took turns playing our own individual repertoire in front of an excited audience. I felt so fortunate to be sitting on stage watching Mark and Eric perform. It felt like I was both behind the curtain and in the audience. This year we’ve added some duets and trios to our program, among them Summertime, the Afro Cuban Lullaby, Mark Hanson’s Canyon Canon and Jose Luis Merlin’s duet based on Fernando Sor’s Study in Bm. (Hearing Eric and Mark improvise around my arrangement of Summertime is inspiring – it’s a ‘gas’ to be a part of their creativity – and all I gotta do is keep the chords straight). We have two performances coming up – first we’ll be performing for the Tehema County Performing Arts Series on Friday, January 15th at 7:30 pm. in Red Bluff, California. 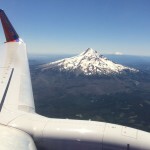 The following day we’re travelling to Eugene, Oregon to perform in the Ray Kraut Studios. That’s on Saturday, January 16th at 7:00 pm. For tickets contact Ray Kraut by phone at (510) 338-2031 or by email at krautguitars@gmail.com. The AGM will be performing in Eastern Oregon this coming April. Look for a date sometime soon in the Portland area! 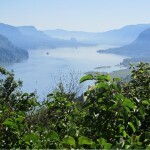 CGI is an immersion experience where 7 guitarists join me for a week of performance preparation on the historic Columbia River Gorge at the Menucha Retreat and Conference Center in Corbett, Oregon. performance skills including the tools to help eliminate the effects of performance anxiety are explored. 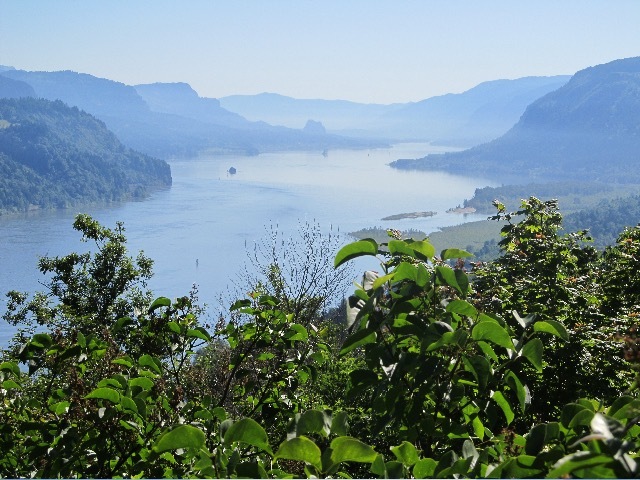 In addition to the scheduled workshops friendships are developed through informal discussions on guitar around the dining table, morning coffee in CGI’s large private kitchen, on walks around the beautiful grounds or at the outdoor fireplace that overlooks the historic Columbia River Gorge. But CGI is more than a week workshop but rather the culmination of months of direction to help in your preparation. Every two weeks, beginning in October 2015 you’ll be sent new practice directives to apply to your pieces. I’ll request a video of one of those works every two weeks to help monitor your progress. Occasionally we’ll all meet on SKYPE and of course we’ll be communicating via my forum. The June 19th-24th schedule includes two master classes, ensemble rehearsal and performance class per day as well as open time for practice and even exercise time. Review the video of your lesson, practice and take a walk around the trails, shoot some hoops, play tennis or swim in the pool overlooking the gorge. All classes take place in Creevey Hall, a large teaching room attached to a large kitchen where personal food items can be stored. works of any difficulty from memory and the required ensemble piece from score. We will perform our final concert on Thursday, June 24th in our own Creevey Hall. 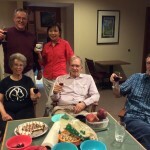 Guests from the community and Menucha Retreat Participants will be invited. In addition we will be working on ensemble music, some of which will be part of our final concert. Each participant will have a private room and bathroom/shower and a shared small living room area. In addition we have private access to a large kitchen complete with microwave, coffee machine and refrigerator. 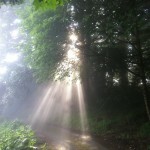 Participants can bring snacks and drinks and store them in Creevey which is locked each night. We will meet in Wright Hall each day for meals. Breakfast, lunch and dinner are covered each day except from Friday, June 17th (dinner only), through Friday, June 24th breakfast. Alternate diets can be accommodated at an additional cost of $39.00 (payable to me). An extensive list of options are available. For more information, and to request an alternate diet, go to http://menucha.org/dining/alternatediet. (Deadline is May 6, 2016). CGI ’16 – $1995.00 and includes all housing, meals and classes. A non-refundable deposit of $425.00 secures a spot. Registration to past participants opens July 6th, 2015. Open Registration begins August 1st, 2016 (earlier deposits will be taken for open registration and any spots that open on that date will be given on a first-come-first-served basis). There are no phones or TVs in the rooms and wifi is rather slow but available. I want everyone to arrive no later than 4:00 pm on Friday, June 17th. 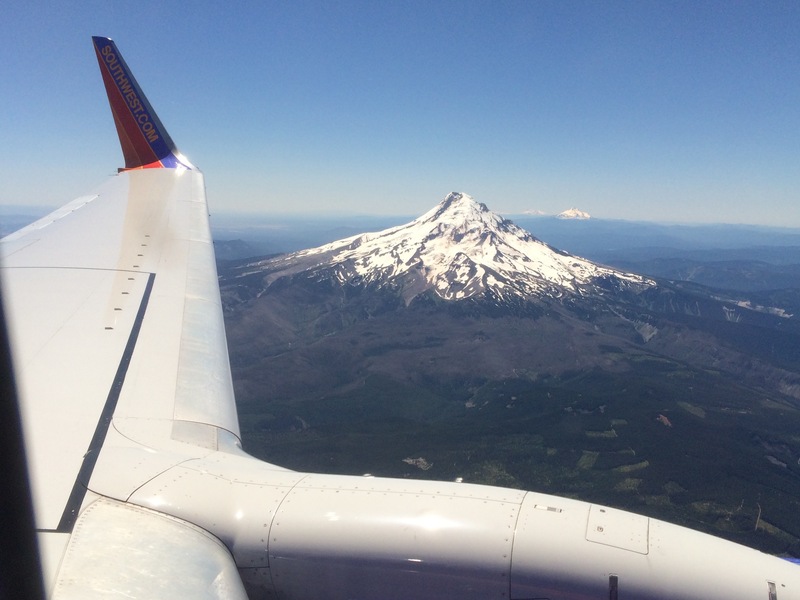 We will form a carpool made of up local students who can pick-up and drop off those flying into Portland International Airport. Students should plan on staying through Friday breakfast, June 24th. I’ve got another month of active touring with performances in Oregon and Washington including a rare Portland appearance. Please find a list of performances, program and ticket information below. Copy the link in your browser and forward to your friends who live nearby! I’ll be performing works by Bach, Villa-Lobos, Albeniz, Default, Weiss, Puccini and Schubert. For tickets call 541-342-3067. 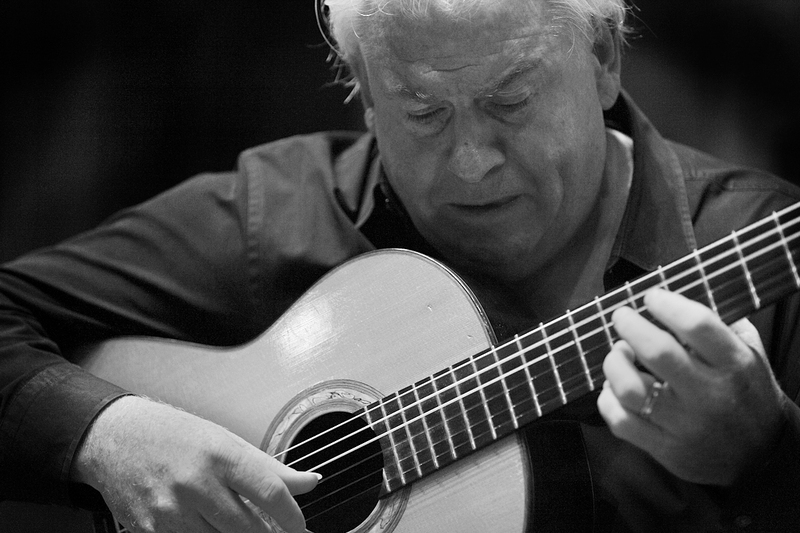 I’ll be performing works from my Classical Guitar Christmas CD – listen HERE. For tickets call 541-953-9204. I’ll be performing the popular Quintet in D Major including the famous Fandango complete with rasqueados and castanets! For tickets call 541-953-9204. For more information go to this LINK. 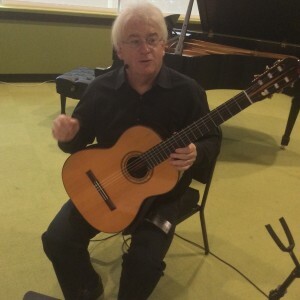 I’ll be performing works from my Classical Guitar Christmas CD – listen HERE. To purchase tickets go to TICKETS. For more information go to this LINK. Please note, Portland fans are staying at the Shelburne Inn. In this retrospective concert celebrating my 50 years of guitar playing I’ll be performing works by Puccini, de Falla, Bach, Weiss and from my Classical Guitar Christmas CD. 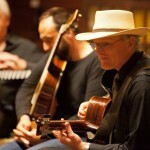 The concert will benefit the Portland Guitar Society’s Advani Fund. 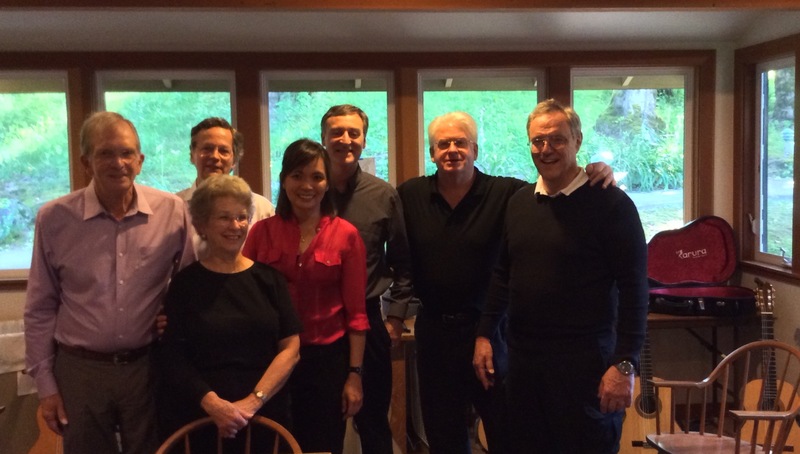 The Society established this fund to help serious students who have financial need to pursue their guitar studies. For tickets go to Eventbrite. For more information go to this LINK. 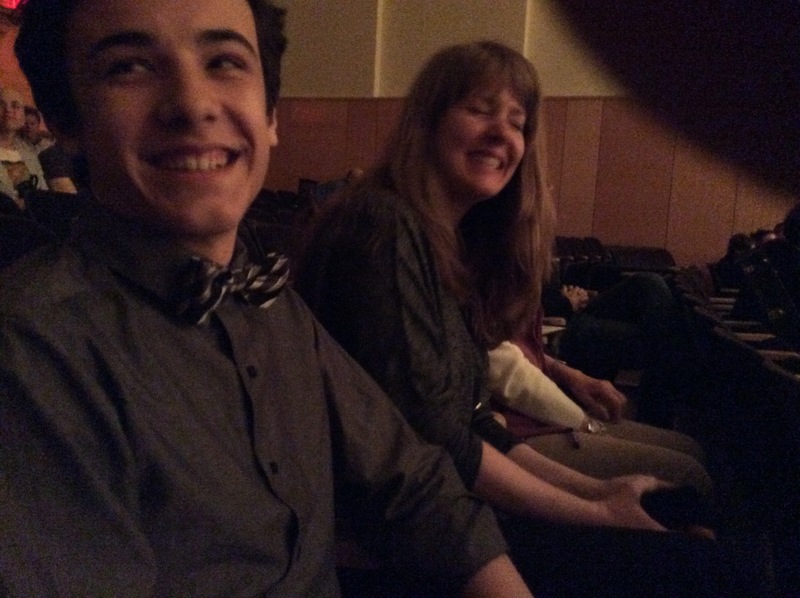 Arrive early and beginning at 7:45 you’ll be introduced to my student, the very talented 14 year old Michael Hermes, who will preview part of his upcoming Portland premiere slated for the spring of 2015. 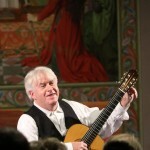 From performing in London, New York, Frankfurt, and the Kennedy Center for the Performing Arts in Washington, D.C., to his hometown of Portland, Oregon, classical guitarist Scott Kritzer celebrates fifty years of playing the guitar with a rare Portland appearance in a retrospective concert to benefit the Portland Guitar Society’s Advani Fund on Friday, December 19th, 2014, 8:00 PM at the Community Music Center located at 3350 SE Francis in Portland, Oregon. 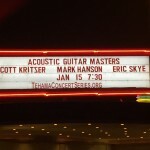 Advanced tickets are $15, available at https://scottkritzerconcert.eventbrite.com. Tickets will also be available at the door for $20. All tickets are for general admission. 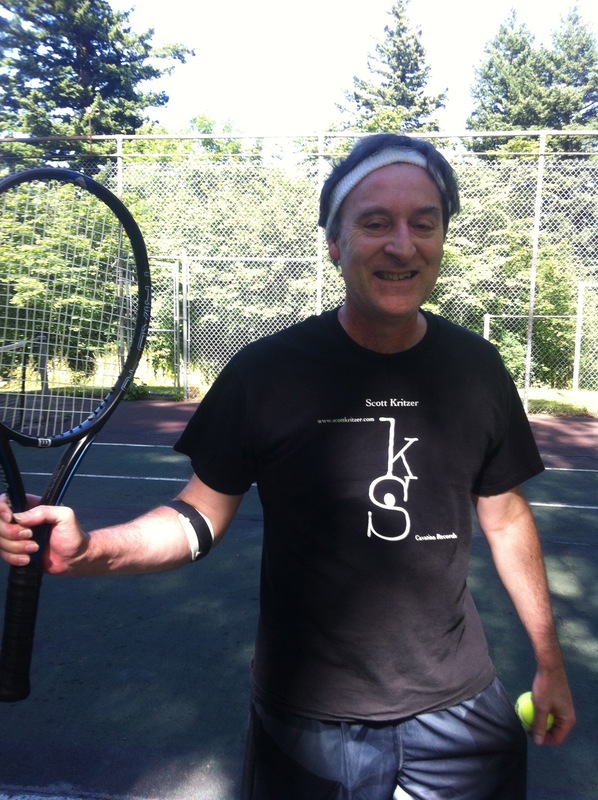 Kritzer’s December 19th concert will benefit the Portland Guitar Society’s Advani Fund. 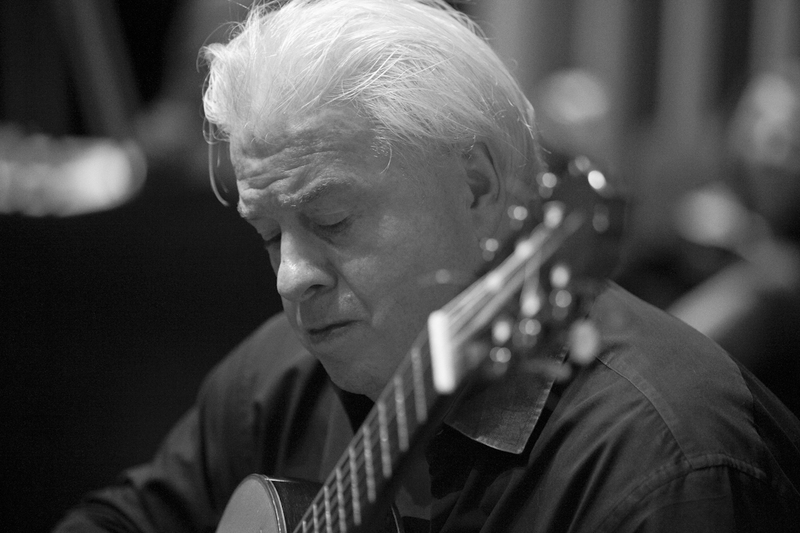 The late Gulu Advani was a former student of Mr. Kritzer’s and an active member of the Portland Guitar Society. 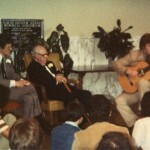 The PGS established the fund in his memory in 1991 with the intent to help serious students of the guitar who have financial need to pursue their studies. Funds are available for lessons, master classes, sheet music or other expenses clearly related to guitar study. Opening the program will be works featured on his upcoming all-baroque recording; three movements from a Sonata by baroque lutenist Silvius Leopold Weiss. He will close the program with a set of works that opened his senior recital at the San Francisco Conservatory of Music in 1980 from Manuel de Falla’s ballet The Three Cornered Hat. Also on the December 19th program are works reflecting Kritzer’s interest in working with vocalists, something he’s done nearly all his career. In between other works by Albeniz and Villa-Lobos, he will be performing his popular arrangement of Puccini’s Nessun Dorma and a premiere of his new arrangement Der Leiermann by Franz Schubert. 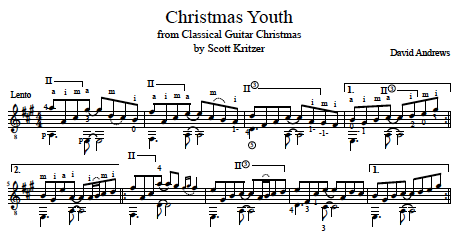 Kritzer will also play a few Christmas carols from his A Classical Guitar Christmas CD.